Lostpedia Blog: Deconstructing: "The Sickness"
After connecting some dots with the opening scene of S5, and that epic investigation the blog did on Ajira Airways a while ago, perhaps there should become a regular segment where we deconstruct a Lost mystery using all the information Lostpedia has on a subject to form a supported theory or answer. 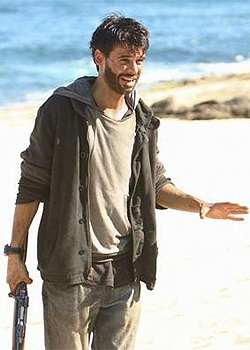 Today, I really wanted to address the sickness, having just gone through Lostpedia's article on it and also the transcripts of all episodes referring to a sickness on the Island. For a more complete and encyclopedic lowdown, see The Sickness page on the wiki. What was interesting this week is that we now know more about the sickness and its symptoms. I think it's a fair bet to suggest that the writers have been playing with us over the years, making links between Claire's condition and the sickness in the episode "Maternity Leave", for example. But in fact, the sickness appears to have no physical "Quarantine" contamination zone symptom - it is apparently all in your head making you either under the control of the Monster or just plain crazy (or both... but the latter provides an interesting theory comparison I think to the 'cabin fever' experienced aboard the Kahana). DANIELLE: We were part of a science team. SAYID: A science team armed with rifles? Was Robert on the team? SAYID: And Alex, was he, too? SAYID: Your distress signal? The message I heard, you said, "It killed them all." DANIELLE: We were coming back from the Black Rock. It was them. They were the carriers. SAYID: Who were the carriers? SAYID: What others? What is the Black Rock? Have you seen other people on this island? DANIELLE: No, but I hear them. Out there, in the jungle. They whisper. You think I'm insane. SAYID: I think you've been alone for too long. Well first it's fun to see Sayid asked the question back then that we're all moaning about now - "how come a science team has rifles". Old news people, old news. But anyway, Danielle says they were there two months before the sickness started to lay in. That would mean either they contracted it later, or it was there unnoticed for a while. Is this just a goof on the part of the writers, or still full truth? You decide what side of the temple you're taking dear Lost fans, and comment so we know! Furthermore there's quite a fun thing in that quote above - though it probably wasn't intentional. If you look where she says "it was them. They were the carriers", and Sayid says "who were the carriers". "The Others", she replies... but did she mean THE OTHERS or the others as in her friends? Again there's been some debate about how Rousseau had implied that the Others were the carriers, and yet Season 5 suggests it is her friends.... but if you actually look at the transcript, it is a little more ambiguous. Notice how Sayid then cuts her off with multiple other questions, ending on "have you seen other people on this Island"... is it a classic case of misdirection? Then again, the way she says "the others" if you actually watch the old episode again sounds very much like she means Ben's Others as opposed to her team. Seems once more it's a matter of interpretation, let us know what you make of it. Lastly, discussing the actual symptoms of the sickness, it is still very early days but is the sickness the Monster controlling them? Or, alternatively, did the Monster just make them crazy and homocidal? It is definitely the Monster that changes them, as young Danielle screams at Robert (again kind of implying that they got sick in the Temple). Perhaps the Monster IS controlling their bodies - making them take out the enemy to keep the Island safe from outsiders (at this point, the Island has been battered by both the US army and DHARMA). Was Robert even alive at this point, or is it like with Yemi where his body had gone and suddenly he appeared to Eko?